This Bike Shop Lesson ended up being rich not just for the students, but also for herself. In exploring the underlying structure, you can touch on many different topics. See Marilyn’s blog, Henri Picciotto’s blog, and Simon Gregg’s tweets for a more there! Here are three trains with length 6, but they are made up of different numbers of cars and types of cars. How many different trains are there? 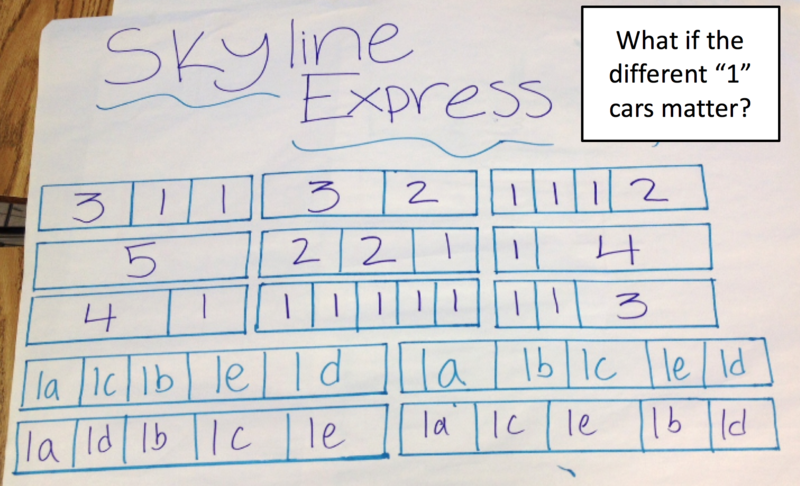 I purposely left the question vague because I wanted students to interpret it in a variety of ways. 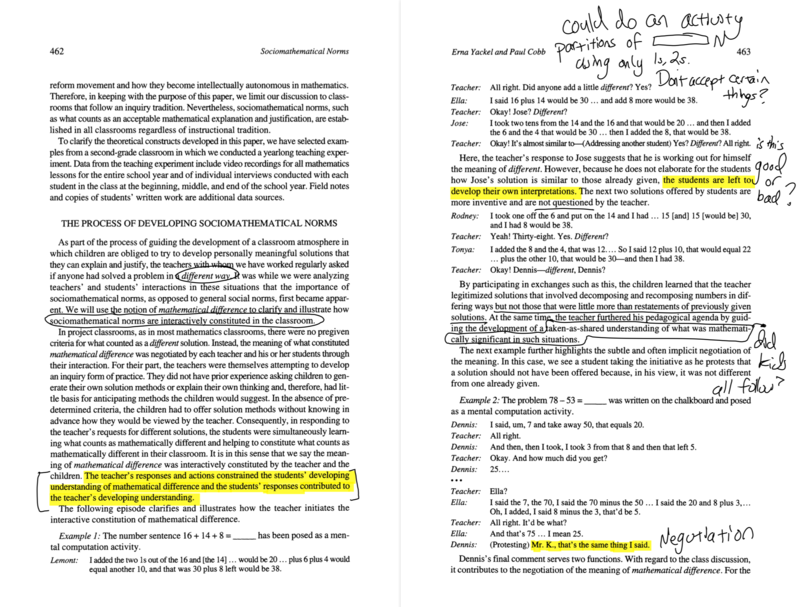 Influenced by Yackel and Cobb’s 1996 article, “Sociomathematical Norms,” I wanted students to develop their own agreements in their groups about what counted as different. 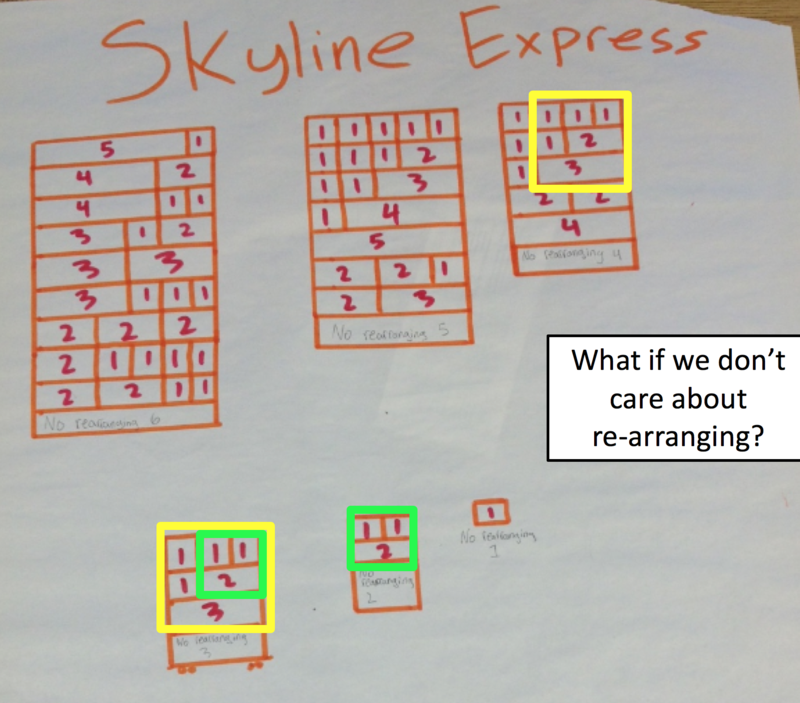 I gave the students cutouts (included in PDF) to support a few aspects of problem solving. First, the scaled cutouts support non-numeric representations. Second, the easy-to-change nature means students can re-arrange the blocks quickly and are not locked to what they have first represented. Third, they must formalize thinking from the cutouts to more permanent representations. And finally, the cutouts are easily worked by more than one person so it can promote discussion in a group. Is 2+2+1 different than 2+1+2 ? What if they’re the same? Are all “1 cars” the same? I was very impressed by how much the students embraced the chance to question the rules and develop their own. Its something we teachers should do more often! I expected to see questions 1 and 6 from the students, but the other questions each surprised me in some way. I learned a lot about what my students could do when given the chance. 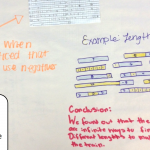 They revealed a lot of thoughts they had about permutations, combinations, sorting, number, structure… I was able to grab onto this knowledge later in the year as we formally talked about those subjects. 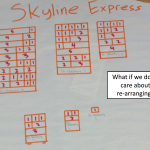 The freedom of exploration in the problem let students from multiple ability levels contribute. One student who was struggling was the one asking about negative car sizes. Its the kind of question that makes you pause; you may wonder if he’s asking about this does he understand the problem? I am very glad I let him explore it with his group. 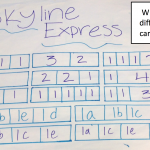 The answer, “infinite number of trains!” is much more meaningful when the student discovers it, rather than the teacher disallowing the investigation by providing the answer. 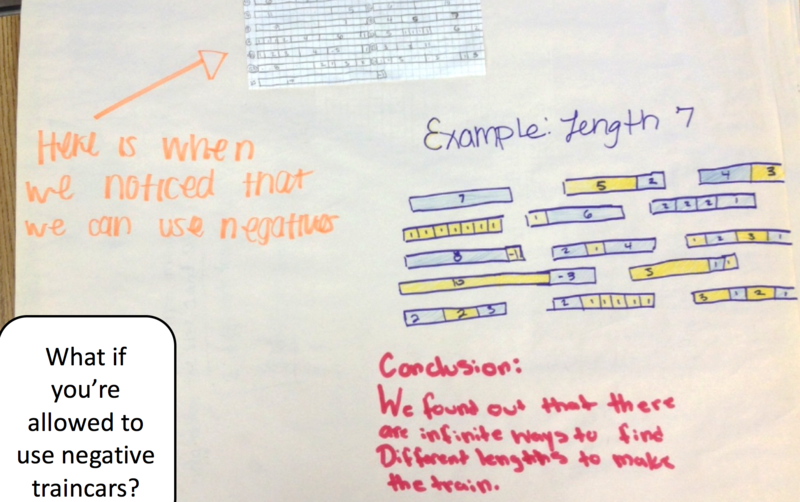 Most groups found the pattern that with certain assumptions, the number of trains of length N is 2^N. 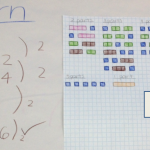 But the exposure to other assumptions generating other patterns was a great place for a meta-discussion about mathematical practice, and the hidden structure of numbers. 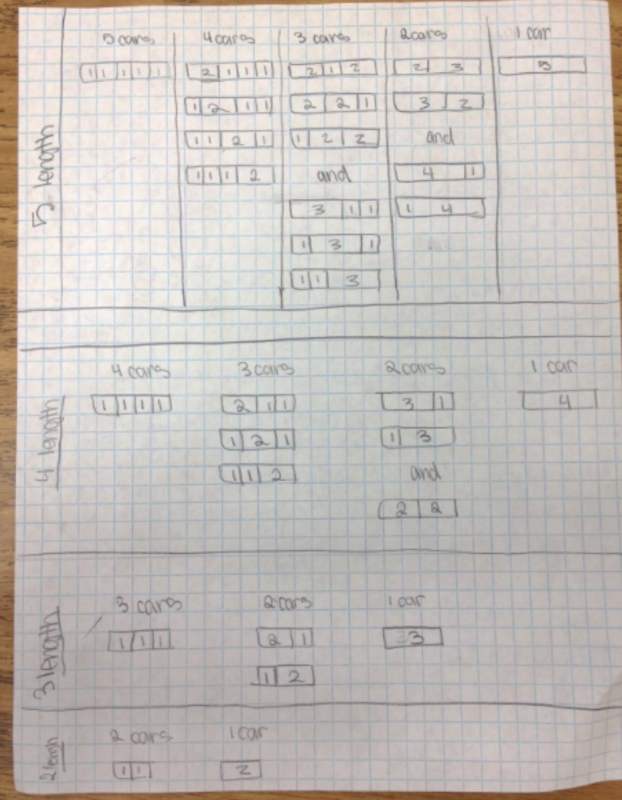 We discussed how some groups patterns fit together and how as a class we explored a lot of boundaries to the problem. We talked then about some of the boundaries we did not explore: such as limitations to only certain lengths of cars. (Notice the limitation to 1s, 2s, and 3s cars is the Cycling Shop Problem! So when Marilyn and Henri were sharing ideas about the cycling shop problem I recalled my students work and how we were linking the various assumptions made into a larger structure. I played with thinking about the unicycles, bicycles and tricycles built from 8 wheels inside the organization of combinations and partitions. 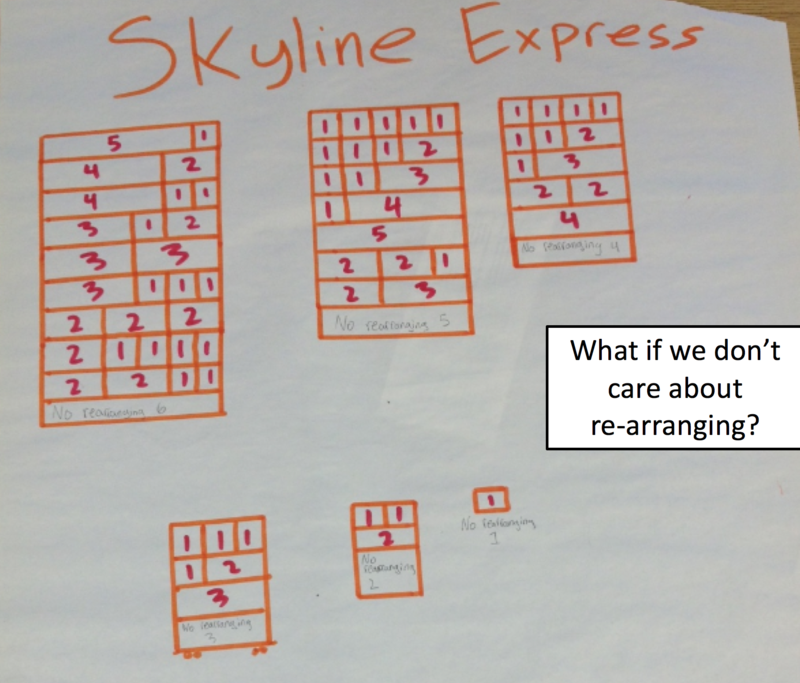 Traincar Lesson PDF – this is ‘localized’ with a playful name for my school and timing in the year (“Skyline Express”) but also I gave it as a participation quiz, so some of the introduction of the task in this pdf is specific to that classroom format. 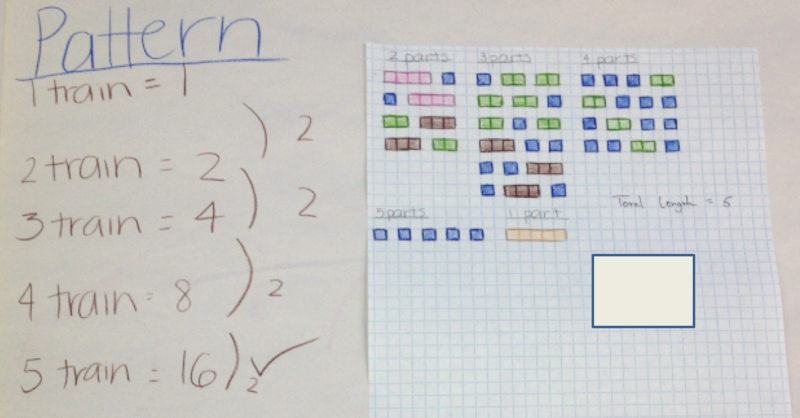 Notice aspects of these partition problems have piqued curiosity of students from elementary school, to high school, to teachers, and of course to professional mathematicians. When the learner has a chance to refine the question for themselves and explore their own ideas, the task is becomes personalized. And when the tasks are personalized then we can make them socialized: people sharing their own ideas and work. 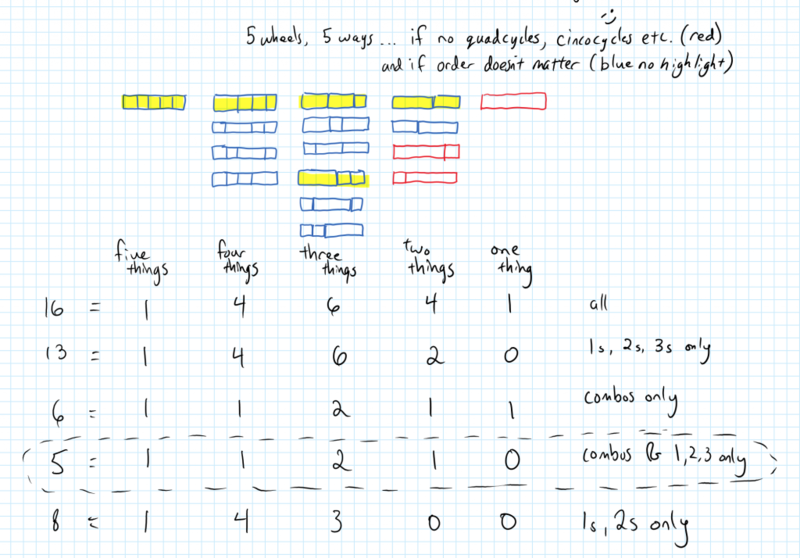 Next post: Just simply an obvious, elementary, clear, basic way to talk math. Any questions?